McLean Hospital was founded on Feb. 25, 1811, through a charter granted by the Massachusetts Legislature for the "Massachusetts General Hospital Corporation." From its inception, the Corporation intended to treat both physical and mental illnesses, with a separate facility for each. Fundraising campaigns were held between 1812 and 1816, and a majority of the contributors earmarked their donations for the establishment of a facility to treat mental illnesses. Consequently, more than 18 acres of the former Joseph Barrell country estate located about two miles outside of Boston in Charlestown, Mass. later Somerville, Mass. was purchased in December 1816. The Barrell mansion, which would become home to the Superintendent of the hospital and his family as well as the central administration building, had been designed by the renowned architect Charles Bulfinch in 1792. Bulfinch and his understudy Mathew Parris were instrumental in the adaptation of the mansion to its new purpose and the design of additional wings as patient living quarters. McLean Hospital was first known as the "Asylum for the Insane," a division of the Massachusetts General Hospital. The Asylum opened on Oct. 1, 1818, and admitted its first patient on Oct. 6, 1818. Following treatment reforms originating in France with Dr. Philippe Pinel and in England with Quaker William Tuke, the Asylum followed the principles of "moral treatment," both in its choice of the country setting and in the care of its patients. The Asylum's first superintendent, Rufus Wyman, MD, was the first physician appointed to such a post in America. When the Asylum opened in 1818, it was the first hospital in New England, and only the fourth special institution for the treatment of the mentally ill in America. In June of 1826 the Asylum was renamed "The McLean Asylum for the Insane," in honor of John McLean, a Boston merchant who bequeathed $25,000 and left a residuary legacy of more than $90,000 to the Asylum. In 1844, 13 Asylum superintendents from the Eastern Seaboard, including McLean's Luther V. Bell, MD, (1837-1856 and 1857-1858), founded the Association of Medical Superintendents of American Institutions for the Insane, now known as the American Psychiatric Association. In the 1840s, 1850s and early 1860s, the McLean Asylum in Somerville slowly lost its tranquil environment, deemed so important in the treatment of mentally ill patients. The Asylum had grown in size, including its number of patients, buildings and acreage. The railroads encroached on the land adjacent to the Asylum and by 1872, two tracks cut through the grounds. From 1872 through 1874, the Trustee Committee on New Sites for the Asylum separately commissioned the now famous landscape architect Frederick Law Olmsted and a local civil engineer Joseph Curtis to conduct site surveys and to report on a suitable site for the building of a new Asylum. In 1875, the Trustees, based upon the Committee on New Sites recommendation of July 18, 1873, purchased 107 acres on Wellington Hill in Belmont from the Waverley Land Company. While Olmsted's involvement after 1875 cannot be documented, Joseph Curtis' involvement in the development of the landscape and building arrangement continued through project completion and into the next century. Superintendent Edward Cowles, MD, (1879-1904) was intimately involved in the planning and construction of the new Belmont site. The Trustees and Dr. Cowles agreed that the campus should be developed and constructed according to a "cottage plan," which called for the erection of a number of cottages where individual patients received care, surrounding a large administration building. According to Dr. Cowles, the cottage plan was intended to create a residential, rather than an institutional, effect for patients. In 1892, at Dr. Cowles' request, the McLean Asylum was renamed the McLean Hospital "in recognition of the present broader views upon the subject of insanity and its treatment." In that same year, construction began at the Belmont site. In April 1895, the first patients were transferred from the Asylum in Somerville to Belmont. 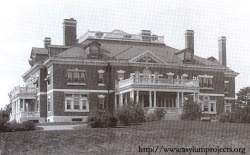 Exactly 77 years from the date of the opening of the original Asylum, the new McLean Hospital opened on Oct. 1, 1895. This page was last edited on 2 February 2019, at 10:21.